More specifically, McCord explained, is that copper comprises about 60 percent of Chilean exports, with China being its largest trading partner. Hence, as China’s economic growth slows, so could Chile’s as a result of lower commodity prices. Which is why McCord proposed a plan, and he recruited some of GPS’s chief China scholars to bring it to fruition: Tai Ming Cheung, Ruixue Jia and Barry Naughton. From Sept. 22-24, McCord led a trip to Santiago, Chile, with his colleagues and the GPS admissions team as a starting point for GPS to help build that Chilean expertise on China, specifically with Universidad Católica and Universidad de Chile and appropriate policymakers. The trip included academic conferences at both universities, where the professors gave public talks on economic development in China and its implications for Latin America as well as background on Asia-Latin American relations. 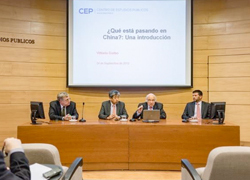 In addition, Cheung and Naughton presented on the economy and geopolitics of China to the Centro de Estudios Públicos, one of Latin America’s leading think tanks. 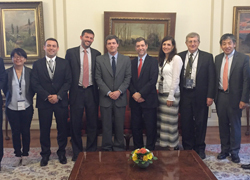 The team also connected with policymakers at the Central Bank of Chile and Fundación Chilena del Pacífico. For Naughton, Sokwanlok Chair of Chinese International Affairs, the visit was an opportunity to provide Chileans the reality of whether or not China will continue buying its copper, among other commodities. His conclusion? The economic deceleration of China is structural, not cyclical. As such, China will scale back buying commodities to instead focus its growth on consumption and internal demand. This will force Latin America, including Chile, to develop other sectors. Even for a seasoned researcher on China like Assistant Professor Jia, she now sees the extremity of the relationship in a new light after visiting Santiago. The trip, which marked Associate Professor Cheung’s first visit to Latin America, couldn’t have been at a more opportune time, Cheung added. For this student recruitment effort, McCord called on the GPS admissions team for help, including student intern Juan Reyes, Master of International Affairs candidate 2016. In many respects, he was the quintessential student for the job: Reyes is a Chilean student who came to GPS to study China, with an international management track. Ultimately, he wants to work in international business or trade, connecting Chile and Latin America with the U.S. and with China. As a first-year student in McCord’s managerial economics course, Reyes said his office hour conversations with McCord often would veer toward a need to bring more Latin American students to GPS. “The idea took more power,” Reyes said once he joined the admissions team in January. McCord worked his contacts on the ground to gauge interest for an event in Chile, including contacting Joaquin Vial, board member at the Central Bank whom McCord also hosted as a 2013 Pacific Leadership Fellow. On a more personal level, Reyes said, combined with his education at GPS thus far, being able to work closely with faculty members and meeting authorities such as Vial in Chile was invaluable to his career goals. McCord divulged this trip already has seen some tangible results. GPS signed a memorandum of understanding with Universidad Católica to begin master’s student exchanges next year and is soon to do the same with Universidad de Chile. “We’re institutionalizing these relationships, but I think the faculty on both sides are excited enough that this will be more than just a piece of paper that gets signed,” McCord said. “There’s a large appetite for the knowledge we can give each other." View a photo album of the professors' whereabouts in Santiago on Flickr.com.